Nokia Solutions and Networks demonstrated the viability of Authorized Shared Access (ASA) -- a new technology that enables dynamic access to underutilized spectrum frequencies. 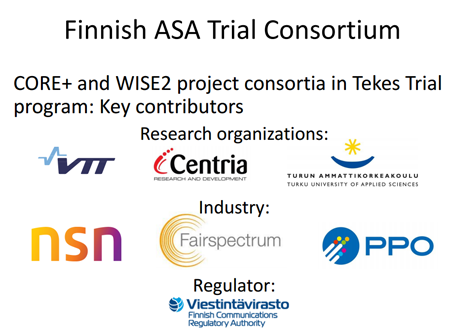 NSN describes ASA and spectrum sharing as enabling technology for 5G. The idea is for mobile operators to share frequency bands from other types of incumbent systems, such as government agencies or TV broadcast networks, while guaranteeing quality of service for both. Earlier this year, NSN and CORE+ consortium took a giant leap forward with the worlds’ first spectrum sharing trial of ASA on a live 2.3GHz TD-LTE network. 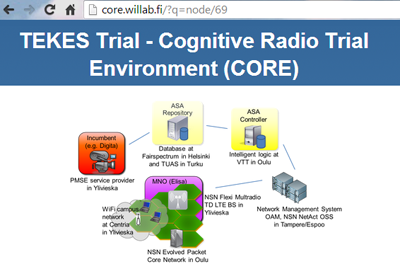 For the live trial, NSN deployed its network elements in three Finnish cities: commercial Single RAN Flexi MultiRadio 10 Base Stations in Ylivieska, commercial Core Network in Oulu and commercial NetAct network management system in Tampere. In June 2013, a U.S. 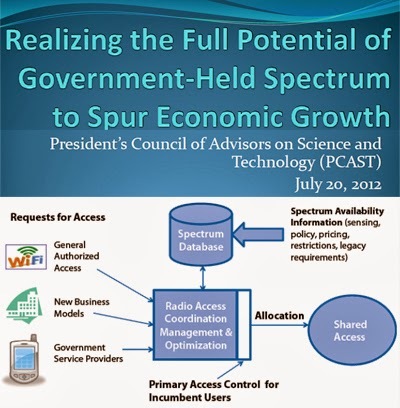 Spectrum Policy Team was formed to accelerate spectrum sharing policies and technologies. The Spectrum Policy Team will draft recommendations on how NTIA and FCC can incorporate spectrum sharing into their spectrum management practices to enable more productive uses of spectrum throughout our economy and society and protect the current and future mission capabilities of federal agencies. The team consists of the Chief Technology Officer and the Director of the National Economic Council, along with representatives from the Office of Management and Budget (OMB), the National Security Staff, and the Council of Economic Advisers. The FCC will undertake a review of its wireless infrastructure policies with a goal to reduce obstacles to obtaining access to rights-of-way and locations for wireless facilities. Clarification of issues addressed in the Commission's "shot clock" order which set time periods for state and local governments to complete review of wireless siting applications. The FCC said increasing certainty in its processes and removing barriers to infrastructure deployment will spur public and private investment, while expanding wireless coverage and capacity. FCC Acting Chairwoman Mignon L. Clyburn stated: "Today, we seek comment on how we can change our processes to encourage greater deployment of new technologies such as small cells and Distributed Antenna Systems. These innovative solutions multiply wireless capacity within existing spectrum resources and can be deployed relatively easily and inexpensively by consumers, enterprise users, and service providers. These newer technologies can be deployed on utility poles, street lamps, water towers, or rooftops -- a big reason why they are becoming more common. The time is ripe for the Commission to look at updating our rules for these new technologies." percentage of cell sites within their networks that are operational during and immediately after disasters. The FCC said its goal is to provide consumers with a yardstick for comparing wireless performance in emergencies. The rules also seek to encourage competition in the wireless industry to improve network reliability. within a designated disaster area. Broadcom introduced a new line of wireless chips for automotive infotainment applications. The new product line, which initially consists of two chips, use use IEEE 802.11ac Wi-Fi and Bluetooth Smart Ready technology to allow drivers and passengers to sync and stream content from mobile devices to the car's infotainment system and rear-seat displays. The new chips also enable high-speed connectivity beyond the vehicle, serving Internet and cloud content via LTE telematics or directly from a Hot Spot connection. "Car connectivity is the new battleground for product differentiation and the next frontier for Broadcom," said Rahul Patel, Broadcom Vice President of Wireless Connectivity. "Broadcom is delivering our proven expertise and leadership in wireless connectivity to the automotive market. By providing the same technology and roadmap associated with the fast-moving mobile ecosystem, the possibilities enabled by our new wireless automotive chips are endless." 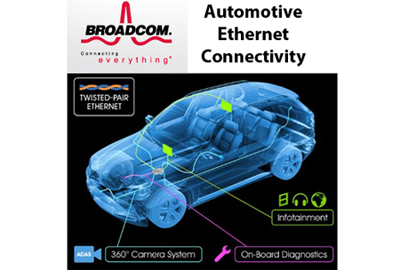 Broadcom has also been a pioneering developer of automotive Ethernet solutions aimed at connecting multiple in-vehicle systems, such as infotainment, on-board diagnostics and automated driver assistance over unshielded single twisted pair cable. Rogers Communications and Sprint announced a partnership to offer in-car infotainment and telematics service to Canadians. Auto manufacturers deploying Sprint Velocity in Canada will leverage Rogers’ wireless networks to connected vehicles on the road. 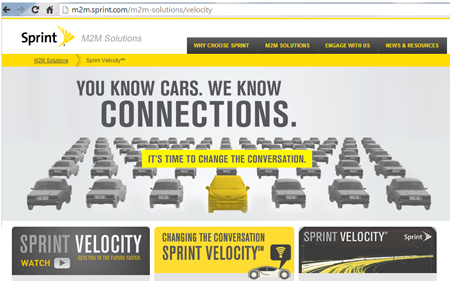 Sprint Velocity is an end-to-end automotive system for vehicle manufacturers that integrates wireless connectivity, customer relationship management and wireless applications. Telstra Global is now offering International Private Line (IPL), Ethernet Private Line (EPL) and Multiprotocol Label Switching (MPLS) services via international gateways installed at Mumbai and Chennai. IPL Services -- dedicated point-to-point links between two key business locations, ensuring security and reliability of voice, video and data communications. Telstra Global’s IPL offering enables customers to control and manage their own networking routing, protocols and security. There is a wide range of bandwidth options available for this service. EPL Service -- Metro Ethernet Forum (MEF) certified global EPL service that enables customers to expand their networks in small and cost-effective increments. Delivered over Telstra’s cable infrastructure using SDH technology, the global EPL service operates at the OSI model layer 2, enabling customers to retain control of their own networking routing and to manage their own security. The network services will feature mesh network architecture, with Points-of-Presence (PoPs) in Mumbai, Delhi, Chennai, Bangalore, Hyderabad and virtual PoPs in Pune and Kolkata. Both Mumbai and Chennai will act as dual international gateways out of India. Gogo hit a major milestone by installing its 2000th commercial aircraft with its in-flight Internet service. Out of the 2,000 aircraft installed with Gogo's in-flight Internet service, more than 300 have now been equipped with the company's next generation service – ATG-4 – that increases peak bandwidth to the aircraft by more than three times Gogo's original service. The company expects to have more than 500 Gogo equipped aircraft outfitted with ATG-4 by the end of this year. Earlier this month, Gogo announced plans to deploy a proprietary, hybrid Ground-to-Orbit architecture by the second half of next year that would combine existing satellite technologies with its Air to Ground (ATG) cellular network. The technology will use satellite for receive only (transmission to the plane) and Gogo's Air to Ground network for the return link (transmission to the ground). Gogo will be utilizing a Ku antenna developed specifically for receive only functionality. 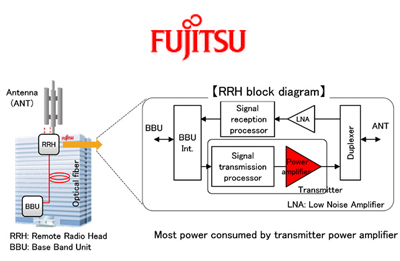 Fujitsu Laboratories has developed a circuit technology that enables industry-leading electrical efficiency for wireless transmission power amplifiers used in radio-frequency wireless devices, such as mobile phone base stations. Fujitsu Laboratories has developed a compact, low-loss power combining circuit along with a high-precision phase error compensation technology based on digital signal processing. These technologies enable high-efficiency transmissions across more than 95% of the transmission duration, compared with 65% for existing amplifiers. In addition, Fujitsu Laboratories succeeded at developing a prototype transmitter power amplifier with a peak output power of 100 W. This development improved average electrical efficiency during transmission, from the current rate of around 50%, to 70%(2). Fujitsu said its new technology will help pave the way toward lower energy consumption for mobile phone base stations and other radio-frequency wireless equipment.